Style - There are three basic choices: traditional, carriage and glass garage doors. Traditional steel garage doors are more utilitarian in look. They are made of sturdy steel panels with a great selection of window and color options. Carriage garage doors have an elegant style and will immediately increase the curb appeal of any home. Sleek glass doors are a perfect match for modern and contemporary homes. Material Choice - Steel doors are the low-maintenance choice. Painted with fade-resistant paint, steel doors are rugged and will maintain their new look for years. Wooden doors are beautiful but require a bit more maintenance during their lifespan. Glass doors are designed with sturdy aluminum or steel frames. Door Design Options - The first choice to make is whether or not your home requires an insulated or non-insulated garage door. After that, the customization choices are many. A wide variety of window, color, and decorative hardware options can help you personalize a garage door to match the style of your home perfectly. 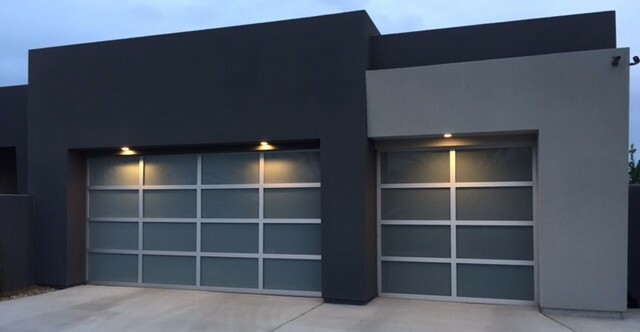 Steel garage doors are a good balance between cost and function. They are built to last and extremely economical. Steel doors are available insulated or non-insulated. When choosing a paint color, white is very popular with many homeowners since the color blends easily with the majority of home paint schemes. Almond, sandstone, and dark brown colors are available, as well as woodgrain appearance. Action Door also has numerous window options that can be added to your new steel garage door to create the ideal style for your home. From a distance it is hard to tell the difference between a wood, wood composite or steel carriage garage door. This type of door can be customized to match any home facade or meet specific architectural requirements. If a carriage garage door is what you have in mind for your home, call for a free estimate so our technician can discuss with you all the color, material, hardware and window options available for your new carriage garage doors. Modern, contemporary homes with clean, simple lines should consider installing new glass garage doors. Glass doors are available in a wide variety of glass options and frame colors. We’d love to help you create the ideal look that will match the modern design of your home.